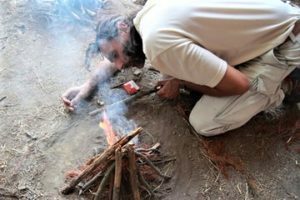 Workshops – Trail Blazer Survival School, Inc.
Wilderness Survival Training can be the difference between life and death. 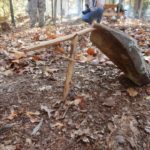 Our Survival Workshops are designed to give people who are unable to take a week or whole weekend off the opportunity to attend our Wilderness Survival Course for a partial day Saturday or Sunday. These workshops consist of Sheltercraft, Firecraft, Water Procurement, Foodcraft, and Tools Class. Check out our upcoming events or contact us to schedule a workshop. Trail Blazer Survival School will be offering an edible plants class at its Union, SC campground location. A Dan Whitten, former president of the SC Native Plant Society will teach participants how to find, identify, and the use of native SC plants found during a wood walk. Those in the Greenville area can register to ride to our Union camp in Trail Blazer's 14 passenger bus. The bus will depart from Simpsonville, SC at 8:30am and return at 3:300pm. The class will begin at 10:00 and end 2:00. This course will be very interactive and informative including hands on instruction with the wild plants that grow on Trail Blazer's property. A box lunch and bottle of water will be provided. 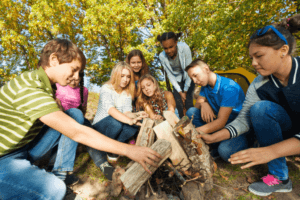 Trail Blazer Survival School will teach you how make your own DIY fire kit, practical uses for fire, types of tinder, keeping your DIY fire kit dry and more! 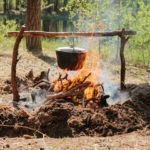 Learn primitive and pioneer cooking methods. This course teaches you how to properly handle meat to avoid cross contamination, process wild game (fish/small animal), different cook methods to include: coal cooking, ash cakes, stone cooking, stone boiling, mud bake, cooking stands, dakota fire pit, dutch ovens, and much more. 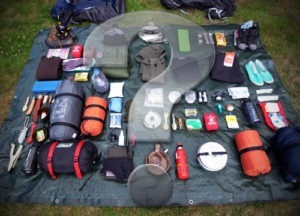 Learn to correctly read a map and compass, and terrain associate. This course teaches the basics of navigation with and without a map. 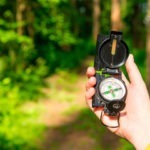 We will go over map and compass reading, taking bearings, terrain association, pace counting, navigation techniques, natural navigation methods, and more. Learn modern and primitive trapping along with various other food procurement methods. This course teaches you dozens of different primitive traps and trigger mechanisms. Students will learn how to use and build multiple hunting implements. 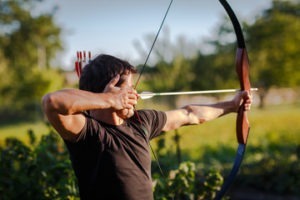 We will also cover how to cook wild game, and identify wild edibles. Learn to identify animal tracks and determine size, weight, and gate of an animal. 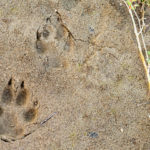 This course teaches you the principles of tracking to include, print identification, substrate analysis, animal habits and habitats, nature awareness, how to use a tracking stick, types of animal sign and how to distinguish them.